Methods in Stream Ecology provides a complete series of field and laboratory protocols in stream ecology that are ideal for teaching or conducting research. This two part new edition is updated to reflect recent advances in the technology associated with ecological assessment of streams, including remote sensing. Volume focusses on ecosystem structure with in-depth sections on Physical Processes, Material Storage and Transport and Stream Biota. With a student-friendly price, this Third Edition is key for all students and researchers in stream and freshwater ecology, freshwater biology, marine ecology, and river ecology. This text is also supportive as a supplementary text for courses in watershed ecology/science, hydrology, fluvial geomorphology, and landscape ecology. 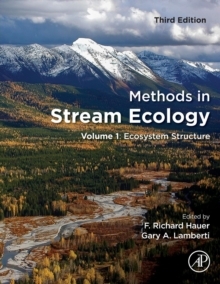 Methods in Stream Ecology, 3rd Edition, Volume 2: Ecosystem Structure, is also available now!